After Ohio lost to Buffalo by 47 points back on February 19, the team could have packed it in for the season, playing out the remainder of their schedule with minimal effort being put towards winning any of their remaining five regular season games. However, not even losing by a historic margin could make these Bobcats quit. In fact, one could even argue that they started a “revenge tour” of sorts. In the ‘Cats three games since the loss to the Bulls, they are 2-1, with both wins coming over teams that beat the Bobcats badly earlier in the season. Bowling Green dominated the Bobcats back in early January, winning 82-63 in the Stroh Center. Ohio turned the tables on the Falcons in the Convo, winning by five in overtime. Next on the tour came the Zips, who embarrassed the ‘Cats on the Convo’s 50th Anniversary celebration were themselves embarrassed last Saturday in Akron by the Bobcats when Ohio beat them down by a score of 73-49. That’s where No. 19 Buffalo (26-3, 14-2 MAC) comes back into the picture. The Bulls travel to Athens Tuesday night for their second matchup with Ohio (13-15, 5-11 MAC) this season, and they will face a more confident Bobcats team than they saw two weeks ago. Over the past three games, since the loss to the Bulls, the Bobcats have averaged over 79 point per game, which is nearly 15 more points per game than they had averaged in their previous 12. The Bobcats have not hosted a ranked team in the Convocation Center since 2013 when UMass came to Athens as the No. 22 team in the country. Ohio hasn’t upset a ranked team at home since January of 1996. The Bulls come to Athens boasting a seven-game winning streak, dating back to February 9. The Bobcats will have to play much better on the defensive end to get the best of Buffalo this time. The 114 points surrendered by Ohio on Feb. 19 was both the most given up by the Bobcats this season and the most points the Bulls have scored this year. A big part of that win was the 19 threes Phillips alluded to. Buffalo went 19-of-33 from beyond the arc, good for a blistering 57.6 percent. However, since that game, the Bulls have failed to shoot better than 43.7 percent from the field and 32.4 percent from long range despite continuing to win. The Bobcats will still have their work cut out for them if they want to pull off this upset, though. 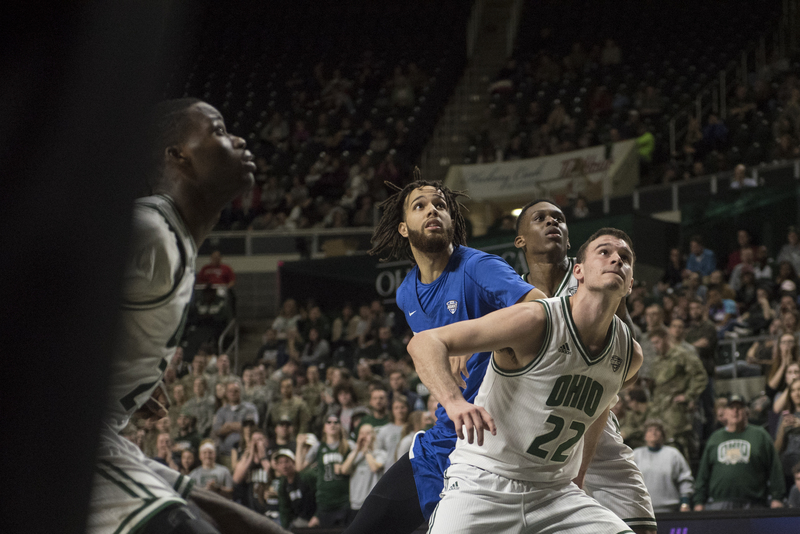 It would take no less than a 48-point swing between the two games for Ohio to emerge victorious Tuesday night. Tip-off between the Bobcats and No. 19 Bulls is set for 7 p.m.